Iceland is known as the land of the midnight sun. In the summer time the days are endless and it feels like you can replace food with energy from the sunlight to fuel up for all the exciting outdoor activities. But Iceland also has a darker side. Eventually the summer comes to an end, and the winter welcomes you with limited sunlight and all kinds of weather – except for warm and sunny! As you run addicts know, running in winter is still awesome – just in a different way. It’s time to set aside your shorts and singlets and bring out your favorite winter clothes. 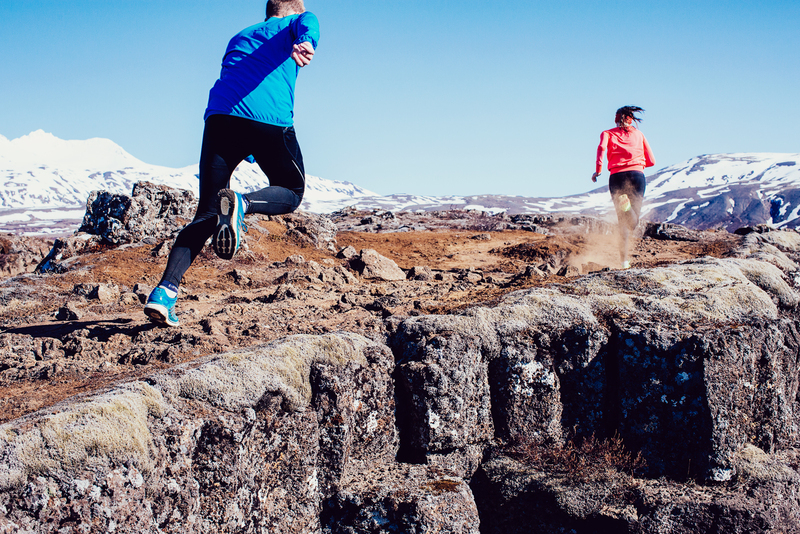 Winter running clothing just keeps getting cooler with all kinds of primaloft vests, technical sweaters and aeroloft jackets on the market. It’s also time to put on layers and in our opinion nothing keeps you warmer than the wool. Did you know that sheep outnumber people in Iceland? Winter running is also a great opportunity to wear neon clothing even though we are way past the eighties. Winter running is the perfect excuse to add some absolutely necessary new gear to your collection. Headlamps come in handy in the limited daylight. Even though Reykjavik city is lit up like a Christmas tree there is little light in some of the less traveled walking paths. For even more excitement, you can use your crampons for some trail running or hiking in the snow. Even though you are not able to enjoy the view of mountains and fjords while running in the darkness it is a great opportunity to go stargazing and recall the name of the stars that you learned in school. And if you are lucky the northern lights will dance for you. Around the holidays, the Christmas lights really brighten things up and so does the snow. Running on a calm frosty night really is magical and peaceful. I assume every runner knows the feeling of checking the watch constantly when running to monitor the pace, or entering a race with the hope running the best possible time. The good thing about winter races is that there is usually no pressure to achieve your personal best. Conditions are typically far from perfect: the route is either covered in ice and snow or the weather is horribly windy and cold – or both simultaneously! Looking out of the window in midwinter the weather may look bad, but once outside the weather is always better than you think – and there is always something extra satisfying about finishing a run in really bad weather. The perfect end to a cold winter run is to soak in the hot tub in one of the many geothermal swimming pools in Iceland. And after that enjoy a hot cup of coffee and cake. You deserve it!